Firstly, it almost goes without saying, The Shard is just a really cool looking building. Appearing like a huge dagger of silver that has dropped out of the sky, it’s certainly eye catching and it’s exactly how I imagine buildings to look like in Hong Kong and other futuristic metropolises. Standing at 310 metres with 95 floors one of the first questions that springs to mind is just how do they fill it? However it’s not purely used as office space, as there is also a 5-star Shangri-La Hotel on floors 34-52, three restaurants and ‘residences’ which are strictly for those with only a taste for the more expensive things in life. Once inside, the building had the feel of a very well-run operation as you’d expect, with impeccably trained staff. As my booking was 9am on a Wednesday morning it was still relatively empty, we were told that once at the top we could stay in the building as long as we wanted, which seemed quite a unique perk and unusual as many tourist attractions usually focus on shipping people in and out as quickly as possible. Once you leave reception you are asked to go through security and its like a small scale airport security check…remove bag and metal objects etc. nothing too strenuous. One of the more memorable things from the experience were the lifts, going at 15 mph, they were not that fast they made you uncomfortable yet you could still appreciate (my ears popped slightly) you were going through some sort of Alice in Wonderland style rabbit hole into grandiose luxury. 'The View from the Shard' as its official title goes offers you the chance to explore two floors, floor 68 and 72. It was hard to know what to expect, but whatever my expectations were they were exceeded, a really bright, clear day helped making the view seem stupidly far. On floor 68 you were happen to look over London and take in the magnificent site and also use some binocular type things which were pretty fun to use, giving you live images and showing you what the view of where you were pointing looked like at night/day/sunrise. They also gave you little bits of info about some of the landmarks you could see such as the MI5 building, Wembley and the House of Parliament. While I was up there we also had the added bonus of seeing the windows get cleaned, a job specification which probably required nerves of steel. They were observed like they were the world’s last remaining Pandas enclosed in a zoo with nearly every tourist staring in amazing and getting a snap. Floor 72 was a chance to wander around the open air viewing deck which was just outstanding. 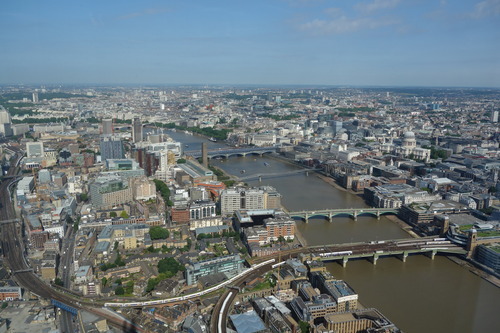 The fact you could look down over the London and stare, unobstructed straight into the sky and hear the wind whistle around you was an amazing experience. After about 90 minutes wondering around the 360 degree deck it seemed that the view had been adequately taken in. The View from the Shard is a really great way to take in London, which allows you to see absolutely everything the capital has to offer.